It pains us here at MYM, when we encounter our own customers who are paying for digital advertising to their local news publisher, and we see the results. Maybe it’s a big media company in town, or a local paper. It’s not the size, because these are offered by companies from the millions to billions in yearly revenue. They offer “Takeovers” and special automotive ‘Extensions‘ or ‘Add-ons‘ promising something special, targeted for automotive. These local media companies are not automotive-focused; they are focused on anyone who will pay to advertise with them. I’m not saying they’re all bad. I’m saying they need to be inspected and let the numbers determine if they are a good buy or not. This is a HUGE problem, and it's not just a one-off case. Far too often dealers have a relationship with the local sales rep; it’s been years, and they just want to be nice and give them business. Dealers believe what they’re being told and think nothing of it. This is a HUGE problem, and it’s not just a one-off case. Every single time I see these services and actually take the time to look ‘post-click’ to see what the quality is, it’s absolutely terrible! This dealer has been paying for special homepage takeovers on their local community media outlet through their media partner. This partner is a multi-million dollar conglomerate, not just a local paper owned by a local company – thousands of employees, millions in revenue. They also offer special “auto” targeted services, touting their performance and advertising to automotive intenders who want to buy cars. They parade their audience size, and their reach etc. This dealer paid 53,779% more than they paid Google for the exact same thing. This particular dealer, throughout 2017, spent roughly $3,750/mo ($45,000 for 2017). They received monthly reports and e-mails from their sales rep, boasting of their performance. “Above industry standard”, however, they report on three items only, none of which identify quality. The ‘Goals’ being measured here include leads, people viewing the directions page, people viewing a new or used VDP, people who spend 6+ minutes and people who look at 6 or more pages. There is a lot of engagement being measured with the configured goals. There is a total of 130 sessions, that equals $28 per session (~click). Consider their Google AdWords is $1.48/click. Of the $3,750 they spent, not one single session viewed a vehicle, in fact only two people did anything at all that indicates they’re interested in buying a car. That’s $1875 per goal completion. Google AdWords is $3.48 per goal completion. This dealer paid 53,779% more than they paid to Google for the exact same thing. 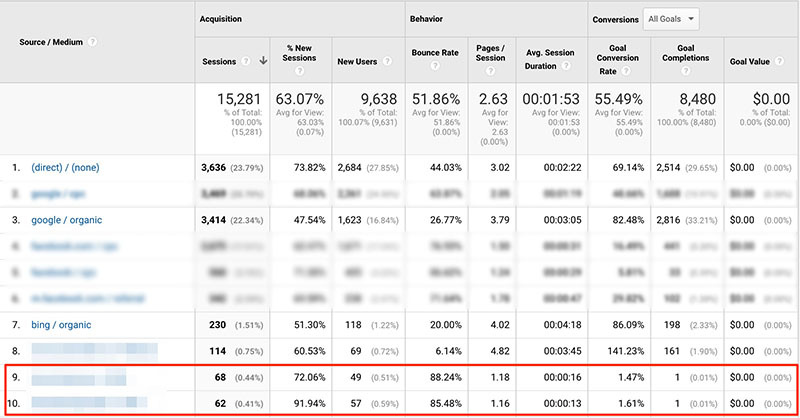 The average time spent on the website was 15 seconds. There is no reason on this earth to pay for these services. They do not perform, not even remotely, close to things like Google AdWords, Facebook Ads, Bing Ads. etc. Your media companies do NOT help you analyze what happens after they send you a click. They don’t care. They only speak about what they deliver, but never judge whether they delivered quality or not. Ask yourself this: Are the reports you get from your media companies talking about clicks, impressions and click through rate? Do they talk about “Flights” ? If they mention all these things and nothing more, you have yourself a huge money hole – guaranteed! Imagine this particular dealer (and it’s a common case) spent $3,750 on Google AdWords. This dealer could have had 1077 people looking at vehicles on their website, but instead, they received two. What do you want – zero shoppers or 500+ shoppers?